The painter is probably the most abused trade on the project. In many ways, the painter is his own worst enemy and in the end many other trades are his worst enemy too. 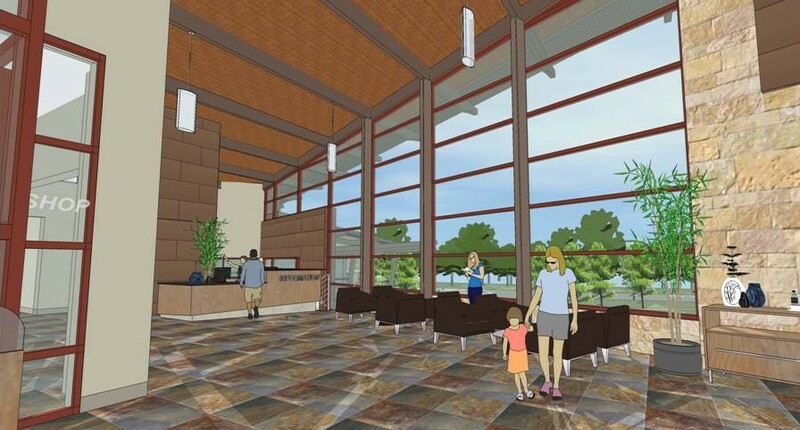 Throughout the project as new trades become involved in the project they add to the work that is already in place. Often times the previous work becomes the substrate for the next trades work to go over. This is true of floor slabs being the substrate for the finish flooring that will come next like the large slate tile in the Gallery. The quality of work of the previous trade can help make the next trade’s work look good or really bad. The painter is required to paint over a large variety of surfaces that can include wood, metal, concrete or masonry. 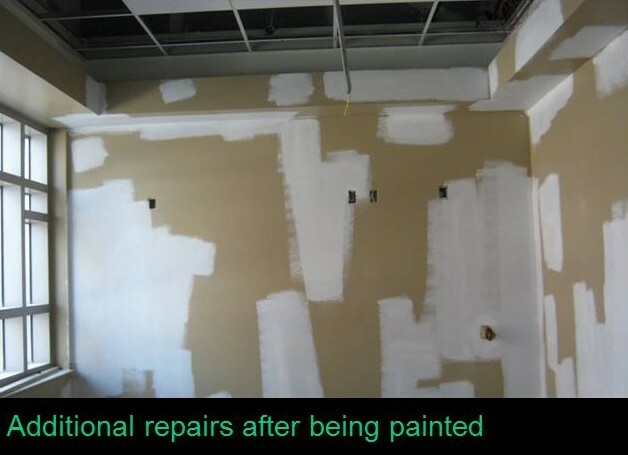 However, for the painter the greatest surface area they tend to deal with are the wall and ceiling surfaces consisting of sheetrock or the gypsum wall board that is applied over metal studs and framing. After the sheetrock is screwed into place, all the joints and corners must be taped and bedded. 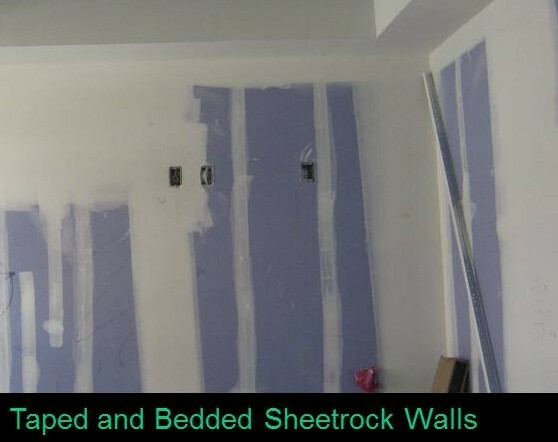 The tape covers the joint between sheets of sheetrock and the bedding is a spackling type material that is troweled over those areas as well as screws to smooth out the wall and have it be a true plane. The bedding areas are then sanded down smooth and sometimes a second round of bedding and sanding is needed. Then the painter shows up. The interior painting specification has a section 3.1 called “Examination.” It requires that the substrates and conditions be examined by the painter and that they are ready for him to perform his work. If there are unsatisfactory conditions, the painter needs to point them out and not proceed until they have been corrected. Once the painter begins to paint over the surface, he has essentially accepted with previous work and if there are any imperfections it is now his bad. Often times the painter is under such pressure to get his work done in order to meet the project schedule that it is hard to catch all of the imperfections. Now is when the painter becomes his worst enemy when his own workmanship causes painting to be redone. 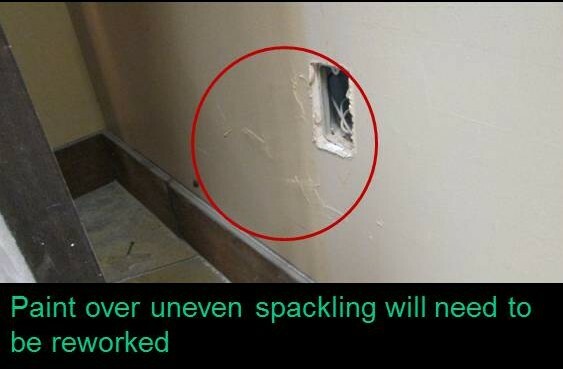 When imperfections in the sheetrock, taping and bedding are found they must still be corrected and repainted. Other times it is a matter of the quality of the work of the painter. Even though the painting may be done within a space there are still other trades coming and going. The wall surfaces are vulnerable to bumps and scrapes. This is when other trades become the painter’s enemy. Sometimes it is known how the damage to a wall occurred and other times it becomes a mystery as if something went bump in the night. In either case, the painter ends up being the one who patches and repaints the wall. It seems that because of all the residual touch up, the painter is pretty much the last trade to leave the job. Throughout the process, the painter continues on in his saintly white attire. There are dress codes that have evolved over time for various trades on the construction site and their origins are often unknown. The painter is in one of those trades that has a traditional attire of white consisting of white pants and shirt or even white overalls with white shirt. The origin of this tradition and choice of attire is a point of much speculation both within and outside of the profession which raises the question “why do painters wear white?” Next time you see a commercial painter, check out his work attire. So I have a certain appreciation for this trade and their traditions as I ran a paint crew while in college. It helped me pay my way through my last years of school. We did it full-time thru the summer and part-time in the fall and spring. And yes we wore white clothing. Why? In college, it was just the cool thing to do even though we didn’t know why. We chose white overalls and white T-shirts as our uniform. We looked good; we were styling.